“Discount Labels is proud to offer the PGJI2 certification to our customers and add to our capabilities of UL Labels,” says Jennifer LaGrange, Brand Manager. Discount Labels has recently been approved by the Underwriters Laboratory for the PGJI2 category of UL Labels. Prior to this approval, the company was an authorized supplier of spot-color and full color UL labels. The PGJI2 product category covers products that are intended to receive additional printing by end-use product manufacturers using thermal transfer, laser or hot stamp-orienting equipment. These labels can be sold as blank labels or preprinted leaving areas in which information is to be added. Labels in the PGJI2 category are available on matte silver polyester, white BOPP and white polyester stocks. Discount Labels specializes in die cut labels, premier labels, durable labels, UL labels, variable data labels, printer labels, magnets, stamps and promotional products for every industry including automotive, construction, healthcare, manufacturing, restaurant and retail. 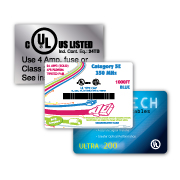 Discount Labels sells through the largest authorized label distributor network in the U.S. and Canada. Eligible dealers are active in one of the following industries: printing, graphic arts, specialty advertising, business forms, packaging and shipping, signs, banners, trophies, rubber stamps, or office products. Established in 1965, Discount Labels has grown to be America’s largest wholesale label supplier. Find more information at http://www.discountlabels.com and visit us on Facebook, Twitter and Google+.